Sturgeon River Preserve The character of this property is wild: the old cedar and hardwood swamps, mossy forest floor and a huge number of upland maples bearing elk rubs, marks from the second largest elk herd east of the Mississippi. 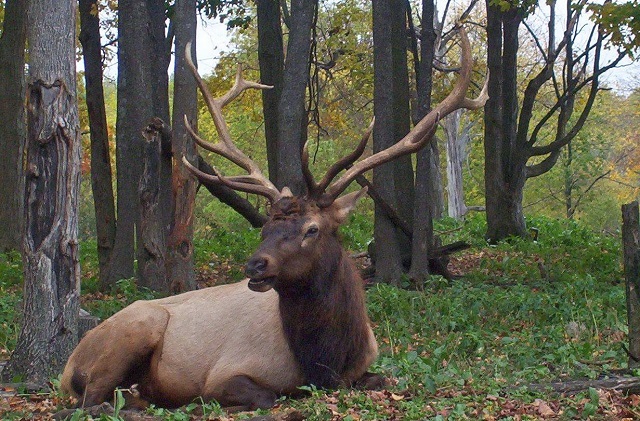 Bull elk use small trees to remove the velvet from their antlers creating “rubs,” which are frequently seen in this area. Enjoy a .75 mile hike, bird watching, cross-country skiing, snowshoeing, fishing and similar low-impact activities at this preserve. Take Old 27 North to Whitmarsh Road and go east three miles. A small parking area is available alongside the road. Five Lakes Natural Area Owned by Gaylord Community Schools and managed by the Otsego Conservation District, Five Lakes Natural Area is always open to the public for non-motorized activities such as: picnics, leisurely strolls, walking your dog, hiking, snowshoeing, cross country skiing and wildlife viewing. This natural area offers 1.1 miles of narrow flat trails. Take M-32 west to Murner Road. Turn right on Murner Road and travel north until you reach Five Lakes Road (1 mile). 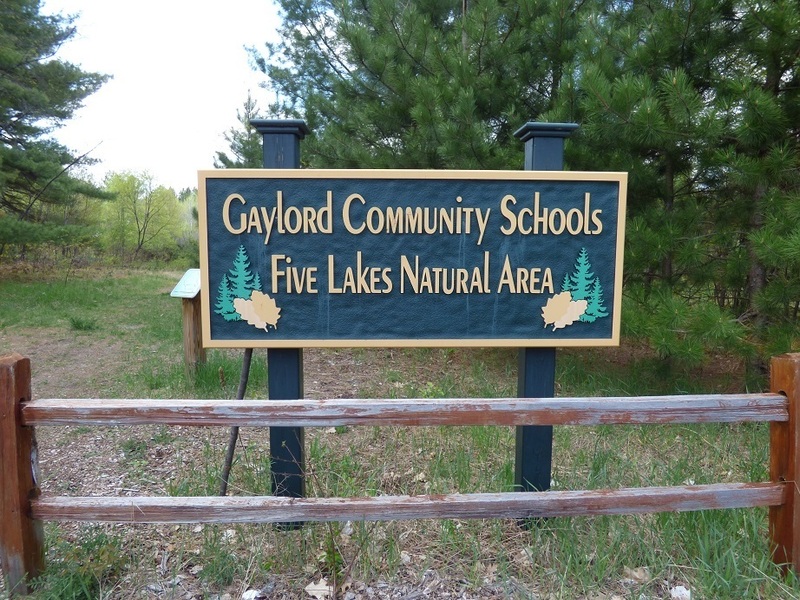 Turn left onto Five Lakes Road and follow it for approximately 0.5 miles until you see the Gaylord Community Schools sign on your right. Pickerel Lake Pathway Looking for a pleasant 2-mile loop with frequent lake views? Meander through an old pine forest and cedar swap while enjoying the beauty of Pickerel Lake. 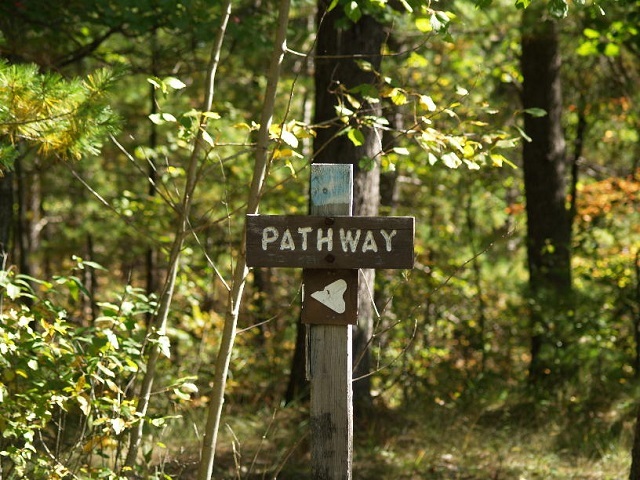 The trailhead is located in the Pickerel Lake State Forest Campground. From Vanderbilt take East Sturgeon Valley Rd, turn left onto Pickerel Lake Rd. Big Bear Lake Pathway Big Bear Lake Pathway is 2.5 miles long and consists of two interconnected loops with most of the trail north of Bear Lake Road. The trailhead is in the Big Bear Lake State Forest Campground. Take M-32 east from Gaylord. In Vienna Corners, turn right onto Meridian Line Rd. Turn right onto Big Bear Lake Drive. Turn left into the first campground entrance. Your trailhead will be at the left end of the park from the entrance and the day use parking area is next to the trailhead. Louis M Groen Nature Preserve This property contains Kujawa and Johannesburg Lakes, along with being the former home to both the Johannesburg Manufacturing Company and Echo Valley Resort. Over 11 miles of hiking trails wind throughout this property. Follow M-32 East to Gingell Rd., turn left on Gingell. The entrance is located at the corner of Gingell and Waters Roads at 2043 Gingell Rd. Pine Baron Pathway If a short, family outing is what you’re looking for, the Pine Baron Pathway is only six miles from the heart of Gaylord. To reach it, take Otsego Lake Drive west to Old Alba Road, continue west to Lone Pine Road and go north to the trailhead. This system of gently rolling to flat terrain has four short loops which average two miles each. The total outside loop is only 6.25 miles, so it makes for a nice hike with children. There are several benches along the way for resting, as well as some nice clearings perfect for a trailside picnic. All the trails are clearly marked and easy to follow through peaceful pine forests and mixed hardwoods. Wildlife abounds, so keep your eyes open for the natural inhabitants of the Pine Baron Pathway. Deadman’s Hill Loop For a taste of the Jordan Valley Pathway, explore the heavily forested 3-mile Deadman’s Hill Loop. Starting and finishing at the scenic overlook, this trail gives you a glimpse into the Jordan River Valley that will only take a few hours to complete. Start on the trail to your right and follow the wide pathway down to the valley. Be ready for a few muddy and possibly slippery areas before you start ascending back up. Jordan Valley Pathway This 18.8-mile trek is a loop, eliminating complicated transportation arrangements, and features a walk-in campground near its halfway point. The fact that it is a two-day walk makes it an ideal weekend outing for backpackers. It has enough climbs, especially on the second day, to give anybody a sense of accomplishment, while many find its logging history an interesting aspect of the hike. 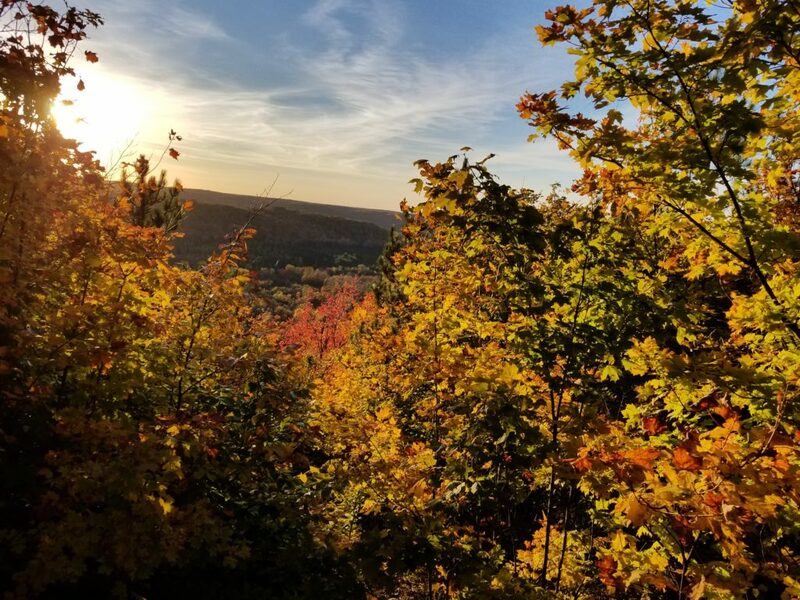 Most of all, the Jordan Valley Pathway is a scenic hike where much of the day is spent either skirting the cedar banks of a blue-ribbon trout stream or climbing to overlooks for views of the valley below. It’s also good to remember that the Jordan Valley Pathway is not an easy trek. You must be prepared to haul a backpack almost 10 miles each day and are constantly climbing in and out of the valley. If you include a side trip to visit the Jordan River Fish Hatchery, which many hikers do, then it’s almost a 20-mile hike. The main trailhead for the Jordan Valley Pathway is Deadman’s Hill, a scenic overlook posted along US-131, 11.5 miles north of Mancelona or 6 miles north of Alba. From US-131, turn on Deadman’s Hill Road and drive 2 miles to the parking area and trailhead at the end. 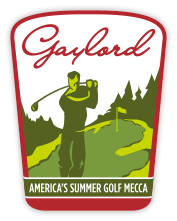 If driving north on I-75, depart at exit 282 and head west of Gaylord on M-32. This vast land, which Ernest Hemingway called the “pine barrens east of Vanderbilt,” and what Michigan pioneer conservationist P.S. Lovejoy liked to call “The Big Wild,” is home to the second largest free-roaming elk herd east of the Mississippi. It also forms a major part of the watershed for three of Michigan’s premier trout streams, the Sturgeon, Pigeon and Black Rivers. The Pigeon River Country State Forest’s expansive 105,000 acres offers a unique wilderness experience with some of the best hiking in Michigan. Certain trails are also available to mountain bikes. High Country Pathway Feeling ambitious? Ready for some real wilderness adventures? Pack your gear, head north through Vanderbilt, then take Sturgeon Valley Road east to the High Country Pathway. High Country is a 70-mile loop that meanders east through Pigeon River Country, Thunder Bay State Forest and Black Lake State Forest. With rustic camping available at several points along the way, an ambitious hiker can cover the trail in 7-10 days. The terrain is varied, taking in scenic vistas, challenging hills, stream crossings and thick growth. Shingle Mill Pathway If you would like just a taste of the High Country experience, check out the Shingle Mill Pathway. It is a popular trail system that begins at the Pigeon Bridge Campground, just off Sturgeon Valley Road, 11 miles east of Vanderbilt. The shortest of the five-segment pathway is 3/4 mile and the longest stretches for 12 miles. Trail difficulty increases with the length of each trail, with some steep terrain along the 6, 10 and 12-mile stretches. 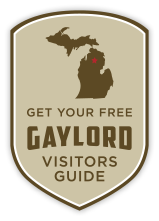 A waterproof trail Map is available at the Pigeon River Country State Forest’s Visitor Center or our Gaylord Area Information Center at 319 West Main Street in downtown Gaylord.